Very nice demo trencher attachment for sale. 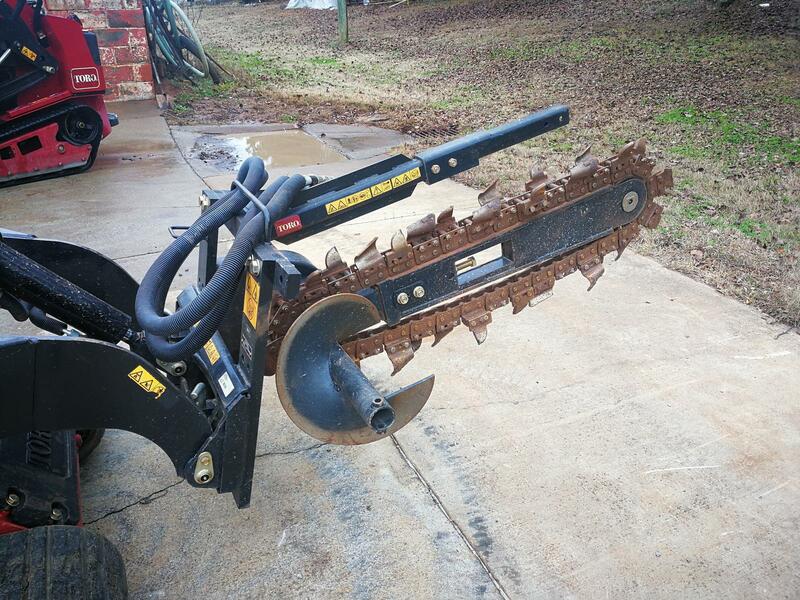 This trencher is set up with a 36" boom and a 6" wide combo chain with rock and soil teeth. This demo unit will come with a full factory warranty and financing is available as well. Reverse the boom on the trencher to double the life! The boom is made of high abrasion resistant material to fight wear and last longer. Designed for easy access and low maintanence. Allows operator to easily adjust chain tension to fit soil conditions. Heavy-duty nose roller bearing with triple lip seal. Allows trencher to be reversed in the toughest conditions to free jams. Chain Tensioner: Designed for easy access and low maintanence. Allows operator to easily adjust chain tension to fit soil conditions. Nose Roller: Heavy-duty nose roller bearing with triple lip seal. Dingo Hydraulic Drive: Allows trencher to be reversed in the toughest conditions to free jams. Trencher Chains: •Cup and combo chains come standard with 2-pitch, anti-back flex design preventing chain links from "flexing" back in tough soil conditions. ; •4" and 6" chain widths available in soil/cup, combo cup/rock, welded rock, and bullet style rock tooth configurations. Lengths for 24" and 36" booms (48" boom chains available in soil/cup and combo cup/rock only). ; •Chain widening kits available for soil/cup chains to increase width to 8" (part number 117-3480) or 12" (part number 117-3481) widths. Trencher Crumber: The Toro crumber is designed specifically to make the trench bottom clean and smooth. The crumber follows behind the chain to clean all "crumbs" from the bottom of the trench. The hardend tip of the crumber pulls any loose material back into the chain teeth. Optional Auger: Recommeded for 8" and 12" chain kits and when using 48" boom - longer auger helps full more dirt away from trench. Part number 117-3433-03.